Arlis Hart was born on September 4, 1919. He got his name from his father's middle name. He lived in Whitley County, Kentucky. He went to Corbin Independent Schools and graduated 8th grade. 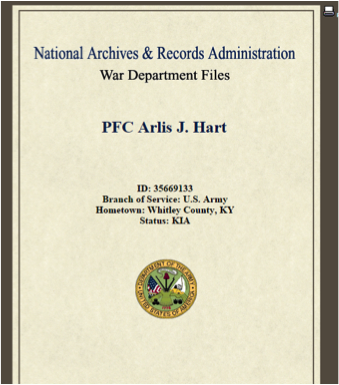 His father was Maynard Arlis John Hart, and his mother was Sarah E. Worley. His siblings were Artie V., Archie T., Lonnie E., Otis M., Kenneth, and Warren G. "Boss". Before he joined the army, he worked as a farmer. He was around 24 when he enlisted in the Army in Cincinnati, Ohio on October 29, 1942. He was a Private First Class (service number is 35669133) and was in the 83rd division -a designated a depot division consisting mostly of Ohio draftees. 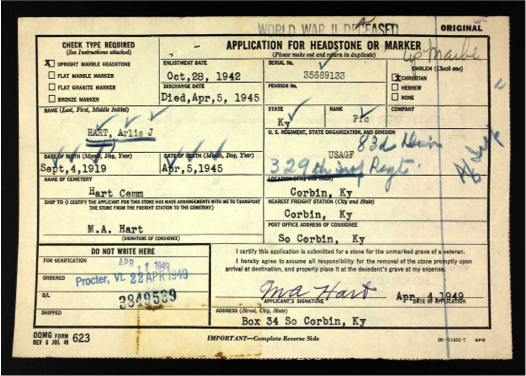 He passed on April 5 ,1945 and is buried at Hart Cemetery in Bacon Creek, Corbin Kentucky.